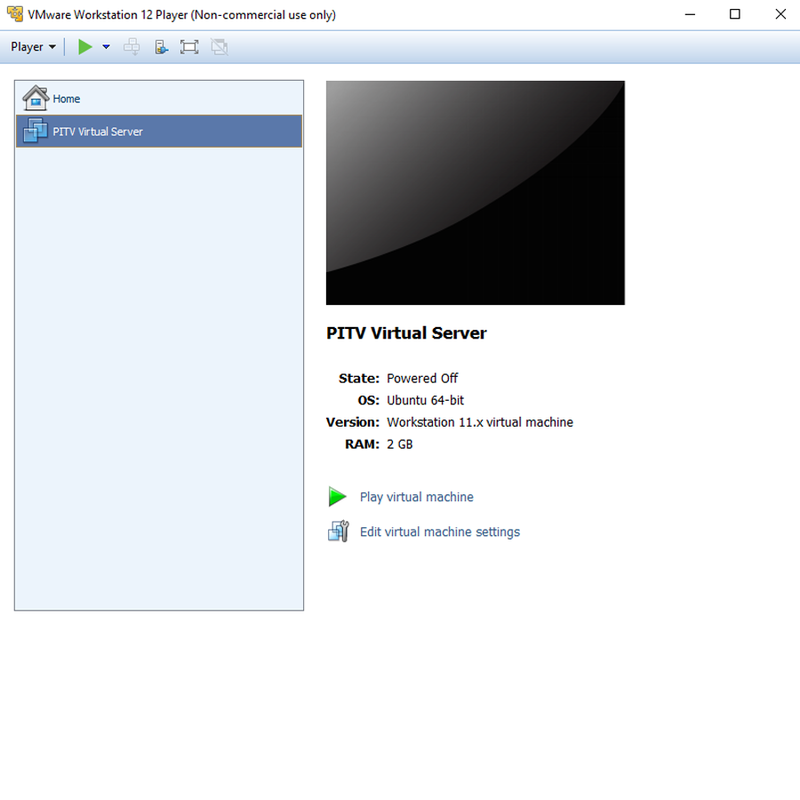 PITV Virtual Server is a single OVA (Open Virtual Appliance) file in OVF (Open Virtual Format) that can be imported into popular free desktop virtualization applications like VMware Workstation Player etc. This allows you to easily run tvheadend server on your desktop or laptop computer and leverage a more powerful recording and streaming platform. 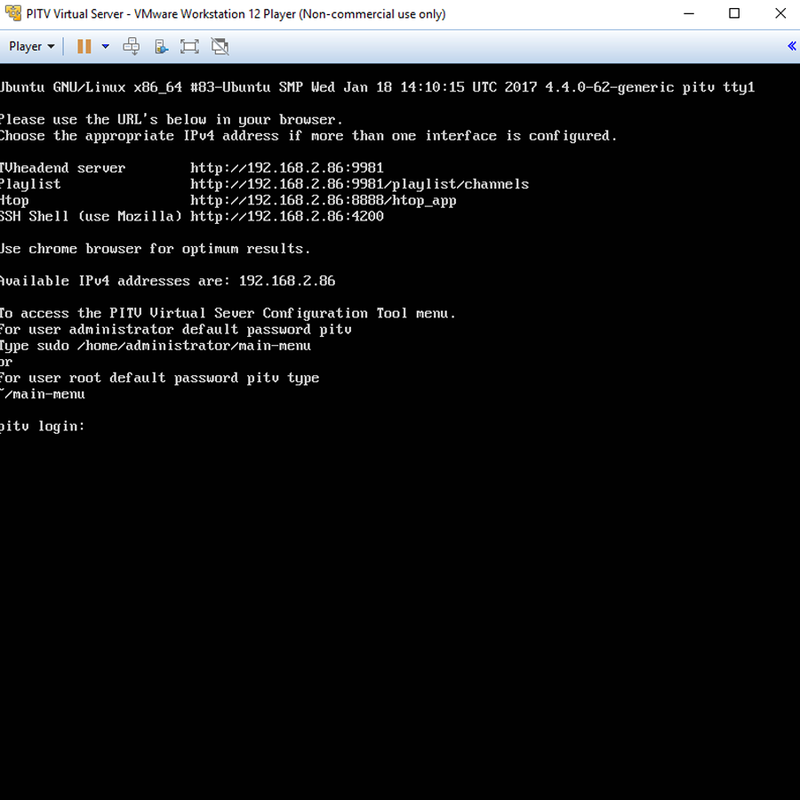 The PITV Vitual Server appliance can also be imported into VMware ESXi virtualization platform (VMware ESi 6.0+) as a virtual machine. A custom configuration menu is provided to allow easy configuration of Network (static IP, DNS or DHCP servers) on the virtual machine as well as easy addition of USB drives or shared storage for extended recording space. Custom Message of the day, htop, shellinabox and console boot summary is also installed that will allow you to easily connect, manage and view performance of your virtual server. 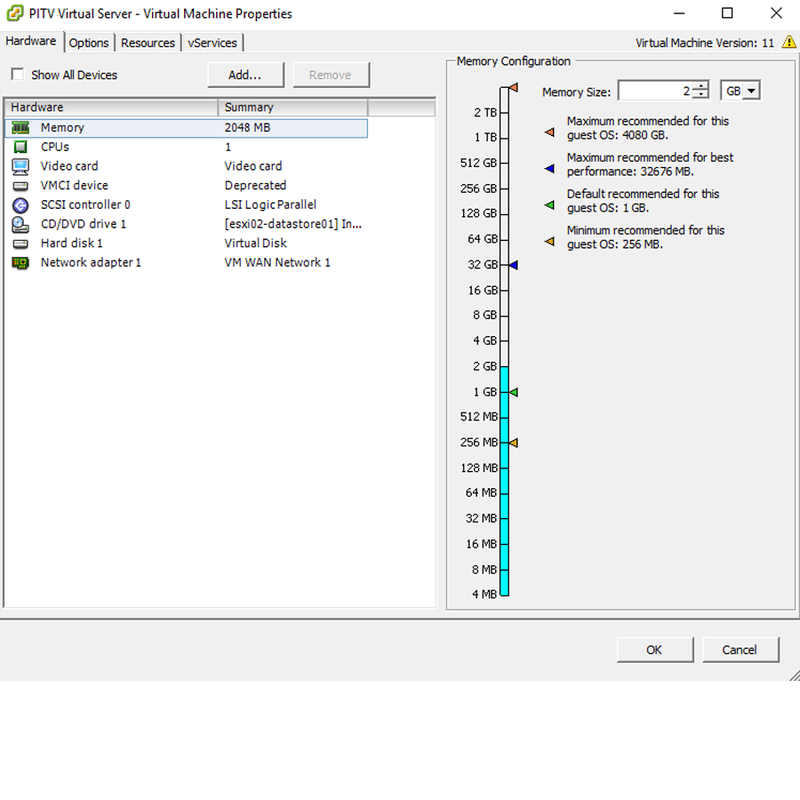 Install VMware Workstation player or VMware ESXi as desired. 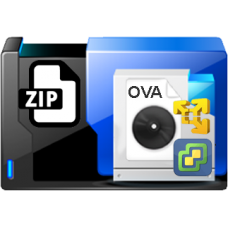 A free copy of non-commercial use VMware Workstation Player 12 is included in the client downloads section. 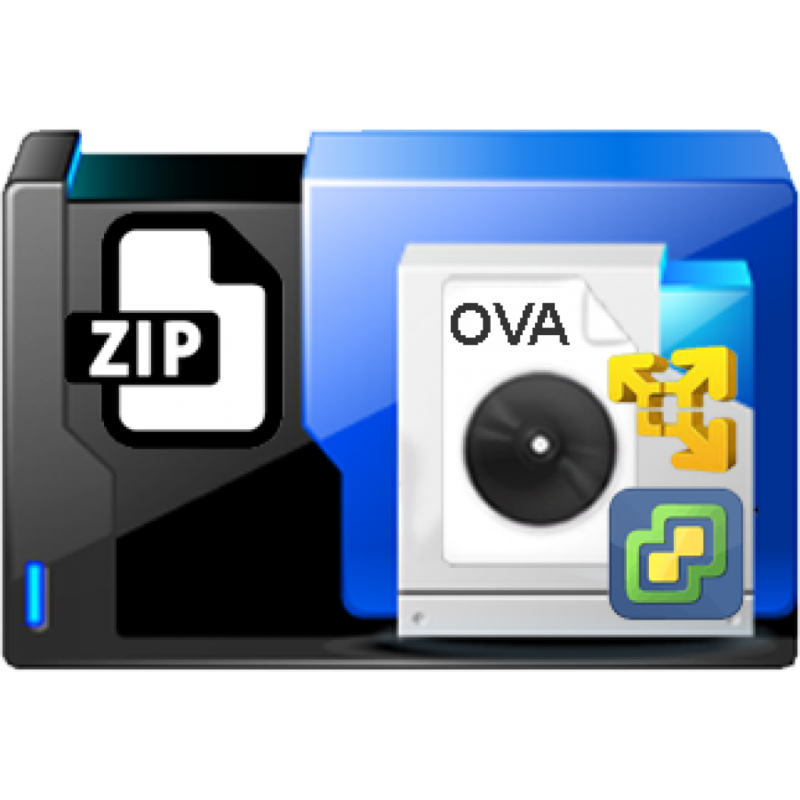 Unzip the OVA file from the downloaded ZIP file and import into desktop virtualization application (VMware Workstation Player etc.) or ESXi Server (VMware vSphere ESXi host). 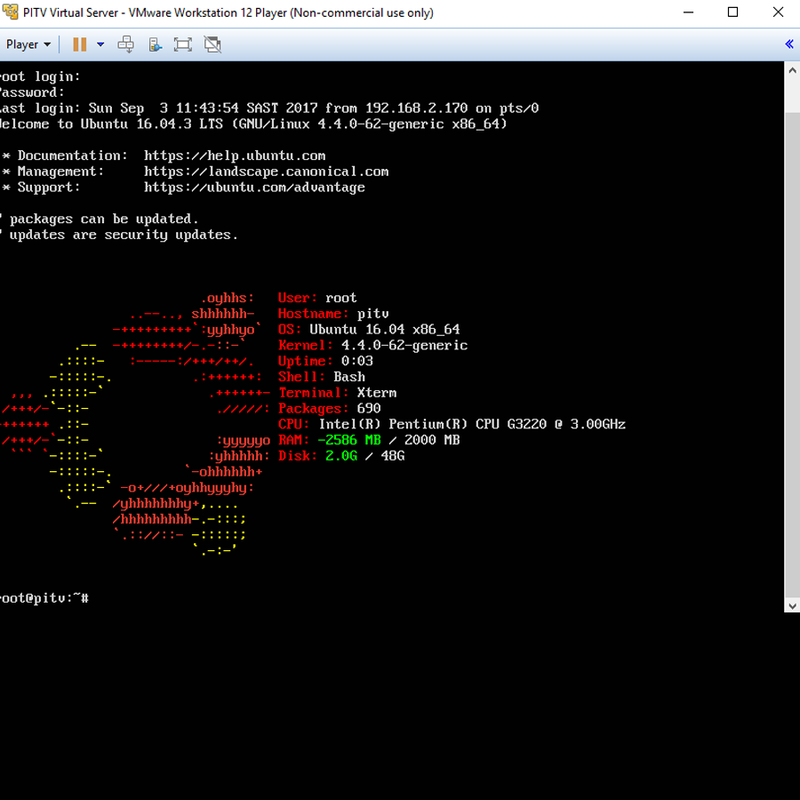 Start the virtual machine and observe the URL's displayed on the console screen when the boot has completed. 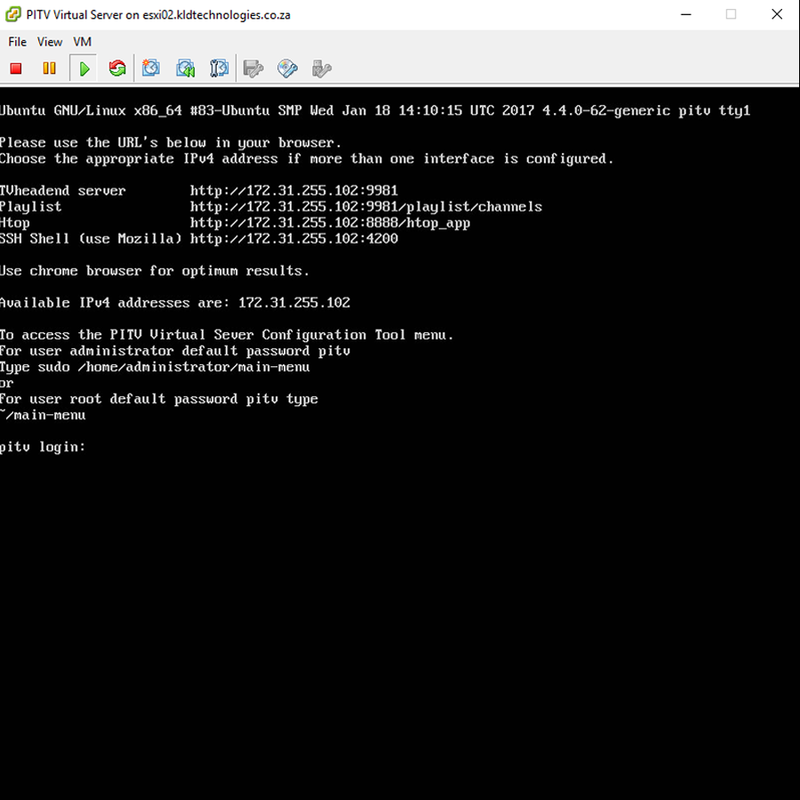 To patch epg for PITV to pitv.za.com domain copy and paste code below into a terminal session and press enter. Using a web browser (Chrome is recommended)login to the TV Headend web URL as displayed on the Console screen. Login as user admin password admin. Goto Configuration -> General -> Base and change User Interface Level to Expert then save changes. Goto Configuration -> DVB Inputs -> Networks click Add, select IPTV Automatic Network from the drop down list. Enter a Network Name (can be anything), Enter a Maximum # input streams value (10 is recommended). Enter a Maximum bandwidth (Kbps) value, This will be your downstream internet speed (for example 20000Kbps is 20Mbits). Copy and paste your PITV stream URL into the URL: text box. Check the Create bouquet checkbox. Enter a Provider Network Name, suggested PITV. Leave the balance of the setings default and click the Create button. Goto Configuration -> DVB Inputs -> Networks and single left click on the Network Name you see listed in the dialogue window that you created earlier. 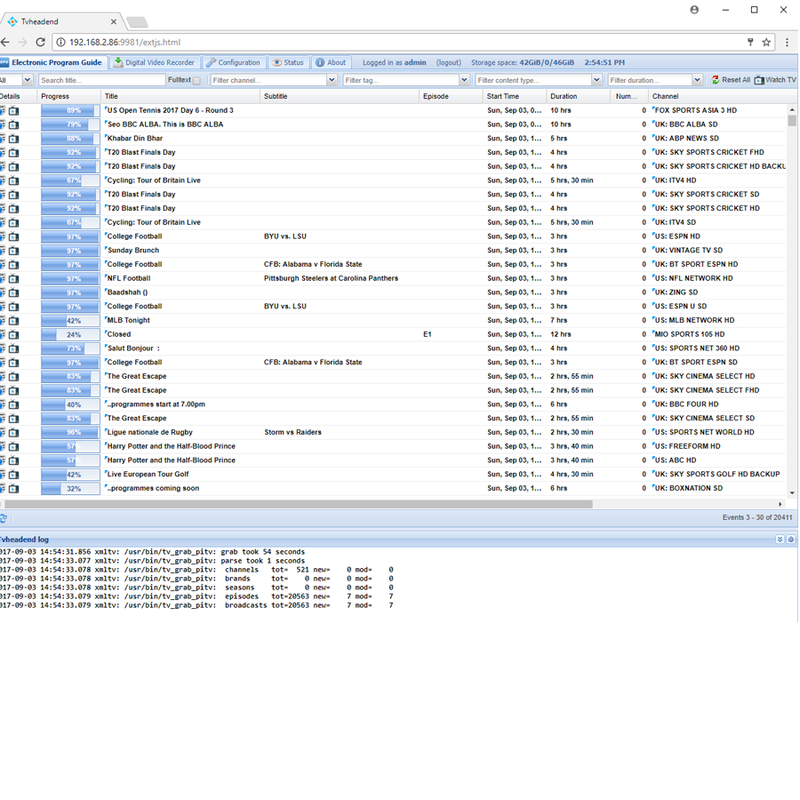 Notice the #Muxes, #Services and Scan queue tabs, you will see that Muxes are now created and a scan is now underway. NB!, allow initial scan to fully complete before proceeding, i.e. there must be nothing left in the scan queue. To disable the muxes lines named channels.m3u by double clicking each line the second coulomb "Enabled" a drop down will appear, select Disabled from the dropdown list, then proceed to the next line, remember to save your changes per page. Goto Configuration -> Channel /EPG -> Bouquets, select the Network Name on the list that you created earlier and click Edit. Check the Enabled Box, Uncheck the Auto-Map to channels box and Paste your Stream URL from PITV into the External URL text box. Click the Channel mapping options drop down, check the last three options. Click the Create tags dropdown and check ony the first two options, the rest must be unchecked. Click Apply, OK, then Save. Goto Configuration -> DVB Inputs -> Services, click the map services drop down Map all or Map selected services as desired. Uncheck the Map encrypted services checkbox and check the Merge same name checkbox. Click the Map services button at the bottom of the opened dialogue window. The Service Mapper window will automatically open, open the Tvheadend log by clicking the double arrow up button at the bottom right of the web page, resize it so it is confortable and scroll down to the last (most recent entries), when all mappings have been done there will be no more entries appearing in the running log and the Service Mapper progress bar will be completed. NB!, allow services to complete mapping before proceeding to next step. Goto Configuration -> Channel / EPG -> EPG Grabber Modules and click the Re-run Internal EPG Grabbers from the dialogue menu. Observe the Tvheadend log, for when the Internal EPG grabber has completed. It will return a channels, brands, seasons, episodes and broadcasts summary when it has completed. Once the EPG grabber has completed, minimize the Tvheadend log and goto Electronic Program guide tab, channels mapped should now have EPG data and be ready for use. Connect Mobile devices (Tvheadend app IOS, Android),VLC Players or remote KODI HTSP tvheadend services as desired and stream or record as desired. For optimal results match one KODI instance to one Virtual server. If multiple simultaneous KODI streaming servers are required deploy multiple Virtual tvheadend servers. Image Zip file containing Raspberry Pi 3 Model B compatible image with latest Raspbian operating sys..